Built in 1910, the Musée d’art et d’histoire in Geneva (ill. 1), a municipal museum, is currently a victim of two evils : its state of decay, due to reduced maintenance, calls for immediate restoration, and the lack of space for its permanent collections which continue to grow requires a larger building. Although it would seem wise, for both technical and financial reasons, to associate these tasks, they are very different in their degree of urgency. To make a comparison which might seem trivial, when a patient, victim of a serious accident, arrives at a hospital, the testing that normally precedes general anesthesia is disregarded given the gravity of the situation but, in the case of a cataract operation, whatever the need, the date for the procedure can be chosen with plenty of time in the weeks or even months that follow. To ensure visitor safety and conservation of the works, the museum building should have been restored a long time ago. In 2004, at the time of the Commission municipal Arts et Culture on 22 January, the “conseiller administratif” (the equivalent of an assistant to the Mayor) in charge of Culture, Patrice Mugny, stated that the statues on the façade were a menace to people walking by and that plaster was falling inside the building. In fact, on 31 August 2007, a large piece of cornice fell in one of the painting galleries without hurting anyone or damaging any works but forced the entire floor to be closed for several months. Cäsar Menz, the director of the Museum, insisted, at that same session, on the deplorable conditions in which the works were held, referring to the temperature and hygrometric degree in the rooms. In short, the necessary repairs should have been carried out years ago. Without dwelling here on the technical installations, especially the air conditioning, it should be pointed out that the building, a masterpiece by the architect Marc Camoletti, deserves a real restoration, and not just a simple renovation, as it is justifiably considered the most beautiful example of Beaux-Arts architecture in the city of Geneva. Will it be necessary to go further and alter the presentation of the works, adopting a more modern museographical layout ? Cäsar Menz had answered the question even before it came up in 1996 in Genava, the museum’s annual journal : while observing that “each museum possesses its own history which it should take into consideration and respect”, he said that the guide in his restoration and refurbishment program was “the objective of reestablishing a harmony and logic which existed before between the collections and the architecture”, a logic and harmony which had been profoundly altered over the last decades. A building addition – a need confronting most museums sooner or later except for those whose collections cannot be modified, such as the Römerholz in Winterthur – raises another set of problems, related to the very nature of the collections themselves. Those at the Musée d’art et d’histoire are extremely varied, ranging from Egyptian archeology to contemporary art, not to mention decorative arts and musical instruments, as well as a gallery of armour and reconstituted décors from châteaux interiors. Should the museum maintain this initial diversity or concentrate on a specialization, making it only a museum of art (the rooms on the last floor are perfectly suited for exhibiting paintings), perhaps finding other homes for those sections which would then be excluded ? The Genava issue mentioned above included a study with conclusions tending towards the status quo, and Cäsar Menz himself reiterated it in an article published in 2000, at which date a major event had already considerably altered the situation (Niké, 2/2000). On 10 March 1998, the Conseil municipal had in fact decided to turn over to the museum an old school located directly behind it, along the boulevard Jaques-Dalcroze. The building soon housed, along with the conservation offices, parts of the technical services department, thus opening up 1.500 m2 inside the museum itself. “reenhance, both inside and out, the beautiful example of Beaux-arts architecture it represented (the best of its kind among the public buildings in Geneva), inside the walls themselves, carry out a maximum expansion of the exhibition spaces, while still respecting the initial objectives of the floors […], […] examining the possibility of covering up the museum’s courtyard, while providing for it to be open during the summer”. Thirty-five architectural firms sent in application proposals. Five were approved for the second stage of the tender. Given the documents which were presented, one would have expected a contest of ideas. It is true that a tender has the advantage of allowing for interviews between the final applicants and the commission of experts ; but a contest requires anonymity and an impartial jury, not a simple commission made up of municipal employees. Thus the term of “concours” used by the press and various publications is therefore, if not deliberately biased, at the very least seriously misleading. After examining the five proposals, the experts chose those presented by two associated firms in Geneva, one of which, Fabrice Jucker’s, was to collaborate with Jean Nouvel. Their project – or rather preliminary project, named “projet Nouvel” and for which we provide further on a detailed analysis – consisted essentially in occupying the museum’s interior courtyard with a series of plateaus topped by a panoramic restaurant. The commissions comments addressed not so much the museum’s needs as the “panoramic terrace” which would ensure the “urban visibility” of the museum, and ended with this convincing argument : “For Genevans and tourists, a panoramic terrace above the museum would re-qualify Geneva as a city with a view”. The silliness (there is no other word for it) of the argument should not let us forget that the project did not correspond to the required specifications. The expression “inside the walls themselves” should have been interpreted stricto sensu, excluding the interior courtyard, since the specifications called for the applicants to propose a way of covering it up. There is no doubt that deviating from specifications can seem to be justified at times ; but in this case, the Jean Nouvel proposal was a serious aggression to Camoletti’s architecture which Cäsar Menz in 2000 had said clearly was to be respected. This inevitably led to another consequence : the restoration of Camoletti’s building was thus linked to its enlargement, since, as Cäsar Menz explained to the Commission municipal Arts et Culture on 22 January 2004, if the restoration was carried out first, some rooms would have to be refurbished again after the work foreseen by the Jean Nouvel project. This would require therefore an overall financing estimated at 80 million Swiss francs. As the city of Geneva did not have the sum at its disposal, the undertaking was put to rest until 2006. That year, on 9 November, Patice Mugny informed the Commission municipal Arts et Culture that he had been contacted by a businessman in Geneva, Renaud Gautier, a member of the liberal party and deputy of the Grand Conseil (the canton’s Parliament), who was offering to create a foundation with the purpose of raising, by a call to patrons, the 40 million needed to finance the Nouvel project, while the other 40 million, for the restoration work, would be the city’s responsibility. Geneva accepted the agreement on condition that the money be raised by 31 October 2008 ; if not, it would abandon the Nouvel project and opt instead for a simple restoration. Indeed, “end October 2008” was written in full letters on the subscription bulletins available at the museum entrance. 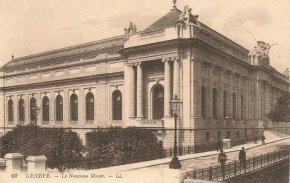 But as the money had not been collected by this date, the deadline, by means of whatever negotiation or tacit agreement, was postponed until end of December, then extended sine die until the Foundation for the extension of the Musée d’art et d’histoire finally disposed of the needed amount. This was the case, more or less, on 16 March 2009, as La Tribune de Genève informed its readers – but Le Temps on the 17th pointed out that five million were still missing ! We cannot help but admire the city’s strict observance of the deadline, and even more so its budget estimate for the works. On 6 November 2006, Patrice Mugny stated in speaking before the Commission administrative Arts et Culture that the “renovation” would reach 30 million for an overall cost of 80 million : the conclusion was that the Nouvel project would, for its part, cost 50, and not, 40 million. However, not only was there no reevaluation of these figures since they were initially mentioned, they were not even based on any kind of reliable study. As the assistant to the Conseiller administratif chargé des Constructions put it, “it is very difficult to have an idea of the cost at this stage of the project”. In other words, there is a high probability that there will be budget overruns which will not be covered by Renaud Gautier’s Foundation. The press was in no way troubled by these misgivings, the Foundation even less so. The latter continued to rally support for the project ; notably, it published a richly illustrated brochure which represents a propaganda masterpiece capturing the attention of readers devoid of any critical capacities. But only an in-depth knowledge of the project can allow readers to appreciate the full weight of the arguments involved. We should start by recalling that the museum forms a quadrilateral figure around an interior courtyard, almost square, on a property sloping steeply towards the lower streets and the lake. The main façade, on the rue Charles-Galland, looks out in this direction. In front of it, the Jardin de l’Observatoire rises slightly then also slopes significantly down to the lower streets. There is a boulevard on either side of the museum building, the boulevard Jaques-Dalcroze, separating it from the old town, and the boulevard Helvétique, both on the ground floor level of the back wing of the museum, but corresponding to the second basement floor under the main façade, with the rue Charles-Galand crossing over them with two bridges. The sobriety of the side wings, on the boulevards, and the back wing is in contrast with the style of the main wing which is more distinguished both in the courtyard façade as well as in the exterior façade, ornated with engaged columns of a colossal size. Inside, the side and back wings house large rooms facing out and smaller rooms lined up along the courtyard. The main façade includes on the elevated ground floor, on either side of the entrance hall, a gallery facing the rue Charles-Galland, and on the courtyard side the immense double staircase looking out on the same street. The staircase leads to a mezzanine level, then to a hallway which opens up onto two galleries formerly containing sculptures and from here to the large painting halls brightened by skylights, with small cabinet rooms on the sides lit by windows on the courtyard. The makeup of the building in its ensemble stands out for its simplicity, precision and logic as well as for the careful attention to light. Jean Nouvel’s contribution includes first of all, as an “appetizer”, a glass pavilion located on the esplanade of the Observatoire, in front of the main façade, a pavilion which is not stipulated in the specifications, housing a ticket desk, information booth, a store and a snack bar. Despite the transparency of the glass, it will act as a barrier hampering the view on the main façade, if only because of the installations inside. It will not be very practical as most visitors will have to cross the rue Charles-Galland twice to buy their tickets. In fact, it seems redundant as the gallery located to the left of the entrance hall also serves to welcome visitors and has a bookshop. The only reason for its presence would thus appear to be a chance for the architect to display his talent outside the building itself. On the inside, the courtyard which, if correctly treated, would be a particularly enjoyable site, and, protected by skylights as per specifications, could be turned into a sculpture garden, seems likely to disappear as it will be taken up by several plateaus (ill. 2). The first would be installed by digging under the courtyard down to the last basement level ; the second one would be on a level with the courtyard itself, the third would correspond to the elevated ground floor, that is, the entrance. According to the preliminary project, the fourth one, where the painting halls are, would be used for receptions, inaugurations and lectures (the current lecture hall, on the last basement floor, having been reconverted into an exhibition space). Finally, the fifth plateau, at roof level, would be the location for the panoramic restaurant. The second, third and fourth plateaus would end at a distance of 1.5 m. from the courtyard façades to allow light to filter in. Surrounded by glass railings, they would join up with the rooms of the original building by means of catwalks. Supporting beams would be fixed into the courtyard walls and the fifth plateau laid directly on top of the first four. The visual documents for the preliminary project were accompanied by a presentation text, a web of incoherency and ineptitude illustrated by the last point : “Creating a mysterious sign through the luminous emergence of this central architecture, the new pole thus revealed by the program becomes an attraction. The Musée des Beaux Arts will once again become a site for modern Geneva” . Unless this in fact truly expresses the architect’s thinking, an unsettling idea, this should be considered rather as a monument to impudence inspired by his disdain for the readers, seen as naïve and not too bright. Let us dwell instead on the more worthwhile aspects which the project claims to offer, and can be summarized as follows : as a major architectural statement, it will bring the same renown to Geneva as the Guggenheim Museum did to Bilbao ; in more practical terms, it will provide the Musée d’Art et d’Histoire with the added exhibition space and the installations currently lacking, beginning with the restaurant, which at the same time will enhance, thanks to its transparency, Camoletti’s architecture. We might legitimately ask ourselves how long the outside architecture of some museums today will continue to attract visitors when neither the collections inside nor their presentation are particularly distinctive. But in the case of the Geneva museum, as the operation affects only, with the exception of the perfectly commonplace glass pavilion, the courtyard inside, it is hard to imagine that this major architectural statement will draw endless crowds. Significantly, the project’s supporters tend to minimize the visual impact, a contradiction in fact, either to appease criticism or to put forward the merits of invisibility. The project thus resembles La Fontaine’s bat : “I’m a bird, look at my wings ; I’m a mouse, long live rats !”  Therefore, to those concerned by the transformation of the urban landscape due to the glass structure of the restaurant, in a protected zone with buildings dating from the late 19th and early 20th centuries, the incredible response was that it would be barely visible from the ground (Patrice Mugny in Le Matin of 26 January 2009), although it in fact rises 4.80 metres from roof level. In the same way, the plateaus in today’s interior courtyard, would be so transparent as to become invisible and would in no way hamper a view of the façades, on the contrary reveal them, if we are to believe the presentation text for the project. Readers probably need no longer be reminded of the vacuity inherent to the claims of transparency in modern architecture, nor the influence they exerted until recently in certain cultural circles, to the point that in Paris the project for the Bibliothèque nationale chose, firmly opposed by librarians the world over, glass towers to house the book collections, in the hope no doubt that their transparency would automatically provide people access to universal literature. Yet, in the case of the Musée d’art et d’histoire, it is hard to see, except for deceiving computer generated images published in the media, what is so transparent about it, except for the railings around the plateaus. Visitors on one of these plateaus will thus be able to glimpse a fragment of the façade, if of course, there is no partition concealing it from their view, therefore allowing only an exhibition of works as discreet as the pollen squares by Wolfgang Laibl. There is no doubt that this very partial scene will reveal the façades. 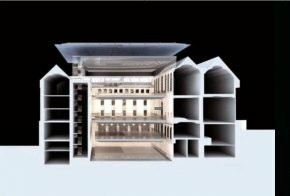 Let us remember that Jean Nouvel’s preliminary project for the massacre of the Opera in Lyon, the plan was to elevate the ceiling of the theater, listed as a monument historique (and which is now lying neglected in storage somewhere) under the new structure, and that this reinstallation was to allow a “rereading” of the work. We can only admire the way the architect justifies the treatment he imposes on national treasures. The fact that the courtyard façades cannot be seen openly, however, is nothing next to the harm they will undergo. Doors will have to be drilled in order to enter the plateaus. These, with an area of approximately 650 m2, will be considerably heavy. The plan is to support them by anchoring them with beams inserted in the façade walls, but there is still no study showing if they will be able to bear such a weight. There is no way of knowing if the walls will suffer sooner or later from serious problems which could only be solved by extensive intervention into the building’s basic structure ; and, if, at the time of construction, it becomes obvious that the support is not sturdy enough, it would be necessary to either reinforce or to anchor the beams further inside the building. In either case, this would mean altering the rooms profoundly. Even if we overlook these pessimistic predictions, which are nonetheless credible, we already know that the back wing will have to be sacrificed entirely along its whole length, height and part of the depth in order to allow vertical circulation. This is why the assistant to the “conseiller administratif” in charge of Constructions spoke, on 9 November 2006, in front of the Commission municipal Arts et Culture, of “essential modifications”, while a member of the architecture department specified that the Nouvel project implied “another major intervention in the current building, one of the structures would have to be sacrificed”. Obviously, this information is not included in the brochure published by the Foundation for the extension of the Musée d’art et d’histoire and was not picked up by the media. Another drawback to the project : the serious disturbance to the museum’s current illumination from natural light. Although the plan allows natural light to pour in on three of the courtyard façades, this will not be possible, due to the restaurant’s size, for the main wing occupied by the great staircase which will thus have to receive artificial lighting. The same applies to the small cabinet rooms. They receive light from the courtyard, therefore the light filtering in between the walls and the plateaus would not be enough. The courtyard itself has been described dismissively as a simple “light well” : if it only played this role, it would still constitute an essential element in the museum’s overall economy as designed by Camoletti. But reducing it to this function alone, is a sign of pure ignorance or a lie : the porticos surrounding it contained, and still do, just like at the Musée des beaux-arts in Lyon before the construction of the Musée gallo-romain, epigraphic and other important documents of the city’s history with an undetermined future when the court makes way for the plateaus. Those spaces in the building which today depend on the interior courtyard for their lighting will not be the only ones affected by the absence of, or insufficient, natural light ; this will also concern the plateaus, which will have to be lit artificially. Moreover, they require a type of museography with well-known inconveniences, that which we saw at the Musée national d’art modern for the first ten years of the Centre Georges Pompidou which had partitions freely arranged to create a flexible space – flexibility, along with transparency, being as we now know one of the two vacuous premises of architectural modernity since Siegfried Giedion. Despite the admirable pavilion built in Barcelona in 1929 by Mies van der Rohe for the receptions of the German business legation, flexibility in a museum prohibits concentrating on the works (a journalist spoke spiritually of a “draft of air museum”) and makes the visit incomprehensible for museum-goers. Presented under a different guise, that of windows scattered around an open plateau, the formula was adopted many years ago, by the Roman-germanic Museum in Cologne, more recently by Nouvel essentially at the quai Branly, because the architect, despite his statements against the Modern movement and his ideas on dematerialization, remains a prisoner of the currents prevalent while he was a student. We might add that these exhibition spaces located at the heart of the museum will only serve to deprive the current layout of the rooms of their logic and clarity ; but that is not the most important issue. The fact is that these spaces will do little to fill the need for an addition, especially given the cost of the operation. The brochure published by the Renaud Gautier Foundation reads as follows : “this project will almost double the Museum’s exhibition spaces, by ensuring 3.800 additional square metres on five different levels”. Does the author of these lines include the restaurant as an exhibition space ? Of the four usable plateaus, one is to be used for inaugurations, receptions and lectures. This leaves the three others, providing a total of about 1.950 m2, to which should be added the current lecture hall in the basement, reconverted into an exhibition room for archeology. Assuming that these three plateaus are to be entirely devoted to presenting the permanent collections (two, in the Nouvel project, would be for temporary exhibitions, thus freeing up a gallery on the ground floor), this is still far from the 6.800 m2 which the collections now occupy according to the statement made by Cäsar Menz himself to the Commision municipale Arts et Culture on 9 November 2006, to which should be added the 1.500 m2 vacated by the conservation offices which moved to the former Jaques-Dalcroze school, not used for years, but it would be misleading to attribute the acquisition of this space to the Nouvel project – although its supporters do not seem troubled by such scrupules. Finally, we would like to point out there is no reason why rooms could not be installed under the courtyard, as was done recently at the Petit Palais in Paris, then reinstall and improve, the flower beds that make it so attractive. The answer would be that what is most essential is not the very limited extra space : when reading the report drawn up by the experts and given that the computer animated image most presented by the press is that of the panoramic restaurant, it would seem that this is the most attractive advantage of the Nouvel project. However, the plan also includes, on the current courtyard level, a bar twice as big as the restaurant there now, thus providing an ample offering for visitors wishing to take a break. But it is well known, for those claiming certain cultural pretentions, that going to a museum restaurant even if a museum visit is not included, is the height of fashion. The restaurant included in the Nouvel project at roof level is therefore not meant for actual visitors, not numerous enough to turn a profit. For this, it will also have to open in the evenings, with the necessary measures to ensure open access and security. But will the view of the lake (at least for the first row of tables) be enough once the newness has worn off to keep customers coming, in a neighborhood which is practically deserted at night ? The city of Geneva already owns about ten restaurants under its management and the problems associated with even the most prestigious ones often make the headlines. Is it really necessary to add more headaches to the ones they have ? To summarize, this project whose cost has not been studied seriously responds only partially to the real needs of the museum (needs which still exclude in our view a rooftop restaurant), but will irreparably damage a building which, except for the lack of space, responds perfectly to its intended function by its layout, elevations and treatment of light. Not only will it undergo serious alterations to its very substance, but we fear, on either a short or long-term basis, that dangerous problems will arise in the structure itself. At the very least, those supporters who are taken in by Jean Nouvel’s fame should inform themselves more accurately about the cost of maintenance and repairs occasioned by some of his architectural achievements once they were finished. All of these reasons have not prevented the Commission des Monuments, de la Nature et des Sites de Genève to issue a favorable vote on the project in its session held on 28 November 2008. In Switzerland, legislation on heritage protection varies depending on the canton. For the most important cases, there is a department on the federal level which gathers opinions from a consulting commission made up of qualified members, as should be the case. Normally, in a democracy, political leaders, not necessarily competent in specialized matters, surround themselves with consulting commissions, and these are of course led by competent specialists, from either elementary education or public health. The Commission des Monuments, de la Nature et des Sites for the canton of Geneva presents the unique characteristic of claiming to represent, much like a miniature parliament, all of the interests of the general public. Thus it includes some representatives from officially recognized associations for defense of heritage, but also, among others, a representative of the real estate chamber of Geneva, for whom preserving the patrimony is not perhaps a high priority, and especially representatives from the political parties. These parties select their members among architects who have the reputation of being competent although their work may not have dealt with heritage conservation or monument restoration. Acting in fact as judges in their own cases, they run the risk of defending their corporate interests, if not their own more personal ones. In this case, the Liberal party has been represented in the last few legislatures by an architect with very close ties to Jean Nouvel, Fabrice Jucker himself. Thus, it is not surprising, given the context, to find that the commission approved the project with a majority vote ! Those opposed to the project are criticized for their immobility : it has to be this one or nothing else. There are, however, other solutions which, leaving the Camoletti building intact, would provide considerably more space. One of these is so common sense that it had already been suggested 70 years ago. The situation at that time was not yet favorable ; it has become so now. It calls for annexing the Ecole des beaux-arts located behind it, along the boulevard Helvétique, at the same time as the former Jaques-Dalcroze school. Built in 1904, the building, abandoned by the Ecole’s management (now housed in several different locations), no longer corresponds to its original use and should, eventually, be put to another purpose. For the price of a sorely needed renovation due to a lack of maintenance and an adaptation which would not raise difficult technical problems, it would provide 6.000 to 7.000 m2 of usable space and would create, besides, a link to the Cabinet des estampes and the Bibliothèque d’art et d’archéologie, museum annexes in a nearby building which are already connected. The only obstacle to this solution is that the building belongs to the canton, with tense political relations to the city of Geneva. However, the city owns enough real estate for negotiating a fair agreement in compensation. The main objection is the urgency of the museum’s needs and that this plan would require years to carry out. But for the museum, the urgency of its extension is not the same as for its restoration. The extension should not be rushed ; the restoration, on the other hand, should have been undertaken years ago. It could have integrated the 1.500 m2 of exhibition space vacated by the conservation offices when they moved, not used since and thus constituting a significant first extension. It was not carried out because the 2000 project associated the extension and renovation needs. As the assistant to the “conseiller administratif” in charge of Constructions admitted on 9 November 2006 before the Commission municipal Arts et Culture, “the scenario submitted today puts a stop to any other project”. Opponents to the Nouvel project are accused of being enemies of the Musée d’art et d’histoire ; but its true enemies are those who for the last ten years have prevented its restoration and a first extension in the hopes of being reflected in the glow of fame emanating from an architect who owes his current celebrity to a genius for communicating rather than for responding to the needs of the users.